I’m working on several projects right now – turning my dissertation on food allergy advocacy into a book, exploring the enmeshment of financial techniques with biomedical research, and launching a VR art series with a group of women artists – and one thing that ties my approach to all of them together is concern about the narrative frameworks we use to talk about science, technology, and progress. Three books I’ve read this fall are grounding my thoughts about the narrative challenges of storytelling in our technoscientific world. 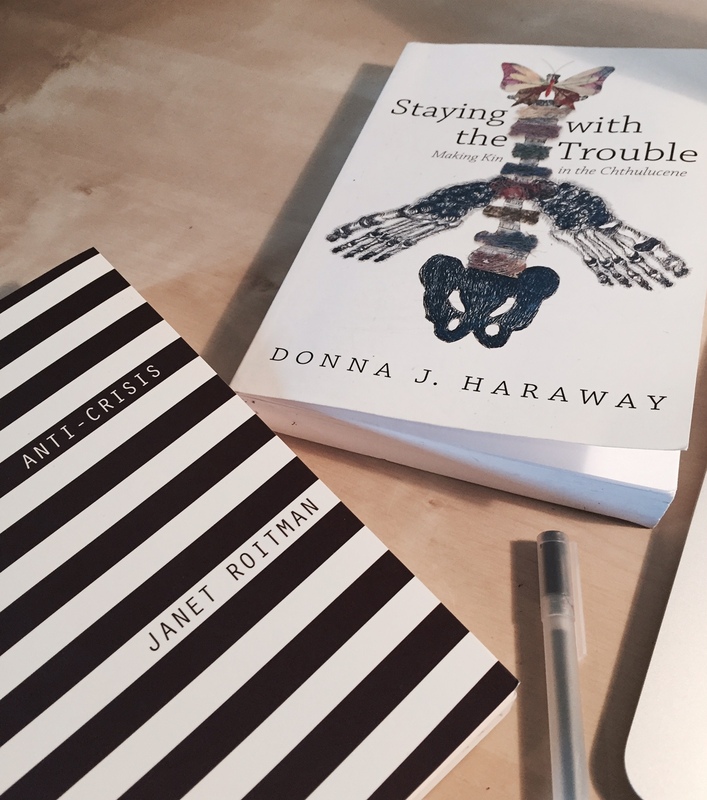 Donna Haraway, remember, is the same writer who declared in the Cyborg Manifesto that we need to do away with origin stories that posit fundamental breaks within the self.The narrative problem for Haraway’s Chthulucene is how to tell stories that do chthonic actors and scales justice. One response enacted in this book is to be willing to tell intricate stories that involve humans, technologies, and non-human organisms as actors, but not as actors in identical ways. Pigeons in current pigeon fancier communities still have pigeon agency and pigeon ethics and pigeon love for other pigeons and their humans. They can do pigeon science in cooperation with attentive human caretakers and scientists. Sheep for the Navajo have figured as material wealth and symbolic wealth as well as economically-important natural resources; the history of Navajo sheep is also a history of colonization, genocide, instrumental scientific reason, identity politics, globalization, woven blankets, and the humans and sheep dogs who tend them. The stories we tell in and about technoscience, who tells them, about whom, and how, all matter for our relational and political futures. Understanding that concepts like “the colony” are unevenly and inconsistently used, and shaped through being used to structure social life, helps us see “their capacity to morph, to identify what might otherwise construe as peripheral sites of their making or as uncertain, wayward, deviating features, set aside because they seem to lead us astray.” By allowing concepts flexibility, we may thus be motivated to uncover more accurate stories about the past and be more imaginative about the political possibilities of the future those pasts produce. In other words, what other stories can we tell, what other worlds can we remember, in order to tell new stories and make new worlds? So what does it mean to tell responsible stories for/in/of technoscience? I think it means a willingness to be complex. It also means being be deeply interested in history without assuming our current concepts and narrative frameworks map onto past or future configurations of nature and society. It means letting go of the idea that history and the concepts we design to describe it provide a simple road map for futures – but simultaneously recognizing that futures mushroom out of the materials of past and present. Knowing our pasts and presents in detail, understanding patterns of oppression and opportunity, means telling stories we might not reflexively think are at the center of things. It means seeking out the stories of the oppressed and forgotten and overlooked to show the full ramifications of the stories of the powerful. Here is the methodological lesson I take from all of this. SF storytelling means taking inspiration from marginal stories to find templates for living together in times that we might otherwise experience as characterized by crisis and decline. Moreover, the concepts and narratives we use to tell our stories need to be understood as changing and changeable. “Food allergy” and “virtual” and “reality” and “biotechnology” and “the corporation” are keywords in my work, but they haven’t meant the same thing all along, and by writing about them I will contribute to their ongoing metamorphosis. So as I write and pursue new projects about contemporary technoscience, I am compelled to ask: Where are the points of resistance, collaboration, and reconfiguration of family and economic structures? Where and how can partial affinities – perhaps based on gender or race, but also based on skills, profession, shared commitments to specific caring practices – be the basis for care-ful remakings of the current social order? These are the tools that matter for making technoscience domestic, scalable, and generative. These are the stories and worlds to tell in hopes that they will generate new kinds of stories that are not premised on separation and decline and world new, more livable worlds. Well done. A more obvious point about labelling a crisis “ongoing” is that it diminishes it, making it something that one can get used to, “normalizing” it.